#57 "Blood for the Blood God! Khorne's Wrath"
Khorne’s Wrath is unleashed! 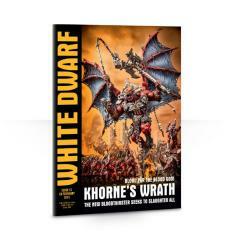 White Dwarf 57 is here and with it the incredible new Bloodthirster of Khorne. Bigger, badder and bloodier than ever before, there’s amazing photography and all the details in New Releases, full rules and a stage-by-stage painting guide in Paint Splatter. Elsewhere there’s a shadowy tale of the Harlequins in Codex: Apocrypha and loads more great content in The Week in White Dwarf. Pick up a copy now – Khorne thirsts for it!